Bedford, is an old medieval market town. Its ancient market still meets on a Wednesday and Saturday every week. There are four ancient churches in the town, including the 14th-c St Mary's and St John's, and the 14/15th-c St Paul's and St Peter's, which is part Saxon, part Norman. The Corn Exchange, which looks over St Paul's square and the market place, was built in 1874. This multi-purpose building was designed to be a concert venue, meeting place and a place of business. Concerts, shows, council meetings and corporate events are still held there. For details see the Corn Exchange web site. 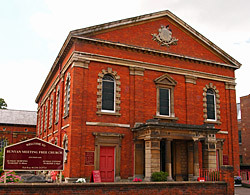 In close competition is the Bedford Civic Theatre, located across the square, which also hosts a variety of events, exhibitions and performances. Bedford's Town Hall and Tourist Information centre is situated behind it. Bedford's most notable writer, John Bunyan, was born in the nearby village of Elstow in 1628. He penned his famous 'Pilgrim's Progress' and other works, while imprisoned in Bedford gaol for his non conformist religious beliefs. The Bunyan Meeting House, on Mill Street, displays exhibits and details of the writer's life and the County Library contains many of his writings, including a rare copy of his first book, 'Some Gospel Truths Opened', published in 1656. 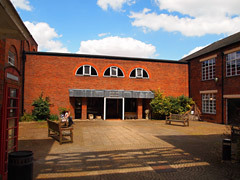 Bedford is also noted for its independent 'Harpur Trust' schools, which are financed by income from the lands of a 16th century Bedford-born Lord Mayor of London, Sir William Harpur. Harpur Square, in heart of the town centre, provides a traditional market place. Also the Harpur Centre, located behind, is a modern shopping centre in the middle of a pedestrianised area, that contains many high street shops such as Boots, WH Smith, Argos, Primark, Fraser Hart, Topman and many others. Very little remains of Bedford's medieval castle, except for the castle mound and a very small section of the outer wall. The castle is located near the centre of the town and surrounded by a small park and gardens. 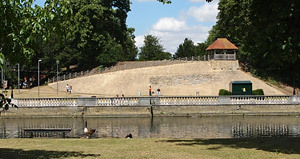 The top of the mound provides commanding views over the Great Ouse river, which passes by its feet, on its way through the middle of the town. The river is bordered by extensive parkland and gardens, known as 'The Embankment', which extends all the way from the town bridge to the Priory Marina and the 200 acre Priory Country Park, on the eastern edge of the town. The Embankment is a very pleasant area to stroll at any time of the year, with its wide open spaces, mature trees, picturesque weir and decorative footbridges. Collections in the Cecil Higgins Art Gallery (former Higgins and Sons Brewery), include a superb range of English water-colours and drawings, plus original prints by Durer, Rembrandt, Goya and others. Exhibits also include English and continental porcelain and one of the best displays of 19th-century decorative art in Europe, plus early glass, furniture, lace and silverware. The museum provides exhibits on ancient and social history, ethnography, coins, medallions, archaeology, local rocks and fossils. This interesting little museum tells the story of John Bunyan the renowned Baptist preacher and author. Exhibits include many of his personal possessions and a replica of his prison cell. Located next to the museum is the 'Bunyan Meeting' hall founded in 1650, where Bunyan was minister from 1671 to 1688. Scenes from the Pilgrims Progress are displayed on in its bronze entrance doors and in many of its fine 20th/21st century stained glass windows. Little remains of the castle except for the main bailey and part of the outer wall. The castle was originally a Norman motte and bailey fortress, founded by Ralf de Tallebosc. It was later fortified in the early 12th-c by Payn de Beauchamp, the son of Hugo de Beauchamp. 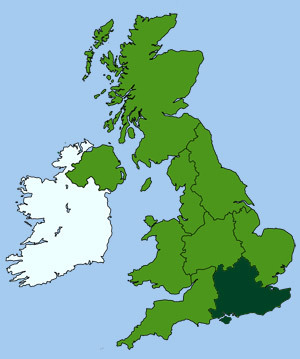 The barony of Bedfordshire was given to the Beauchamps at the time, who became the most powerful family in the county. Location: between the museum and the river embankment.